Bingo is our resident poet for the Rebel Wayfarers, and for Jase he penned two poignant poems. Both of them are dedicated to DeeDee. of a full life still to come. He exited the car, stretching and rolling the tension of driving for several hours out of his back and shoulders. He was about to pull his bag out of the trunk when he heard the front door open. 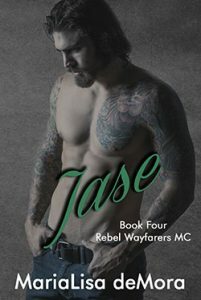 “Jase,” his mother called, walking towards him with arms stretched open wide. Jacqueline Spencer was an attractive woman, even at sixty-five; nearly as tall as he was and he thought with a wry twist to his mouth that she was probably still able to take him down. He shook his head, smiling as he wrapped her up in his arms, hugging her tightly. “He’s inside. I’m about to put food on the table, eh? Come in and eat, I’ve made brown toast with the eggs. Your Dad wanted white, but I’m making enough concessions with the frying, aren’t I? You’re looking good, fit and healthy. Healthy is good. We watched the games, saw you got a lotta ice time during the playoff games, didja? Congratulations, Jase! My boy’s a cup winner. Oh, it’s good to see you, son.” She never slowed her chatter, just wrapped one arm around his waist and pulled him alongside her towards the house. Entering his parent’s home was like stepping into a time warp back to high school, the décor unaltered and the layout still the same, even the furniture placement hadn’t changed. He craned his neck to look into a hallway to verify and saw that yes, in fact, the same pictures from high school of him and his older brothers were still hanging on the wall. He saw there was a single empty rectangle and sighed, shaking his head. “Good time, yeah. Was a shame, though, traffic was a bit congested in Olds.” His parents both laughed at the old family joke because while Olds was the largest town between Red Deer and Calgary, it was small enough it was unlikely to ever have a traffic jam. Conversation continued back and forth during and after dinner, talking about his mother’s charity work and his dad’s staffing issues at the firm where he was a partner. Jase told them about the playoff series, reliving some of the critical moments with them. After dinner, one of his brothers showed, bringing his two oldest boys for a quick visit. Their favorite Unka Jase wrestled and played with the kids until they were exhausted and irritable, handing them back over to their dad with a wicked grin and a shrug. Bedtime came and he was standing in the doorway of his childhood room, studying the furnishings with a sigh. This was the one place he’d have really liked to see a change, but time had stopped in this room, too. Oh well, he thought, I slept my last two years under this roof with my big, cold feet sticking off the end of the bed. It won’t hurt me to do it a couple more nights. Next morning, he dressed for his run and stepped outside, taking in a deep breath of air, noting not for the first time that it smelled so different here from Chicago. After stretching, he set off slowly, gradually building his speed as he crossed and re-crossed the river for which the city was named, settling into a moderately fast pace for the last half of his run. Back at the house, he showered and then looked for his mother, finding her on the back deck, tossing a ball for one of the neighbors’ dogs. Sitting on the bench next to her, he watched as she threw the ball over and over, each time working hard to coax the dog close enough to surrender it again. “You have a lot more patience than I do, Ma,” he laughed, startling the dog into stepping back. “No doubt it comes from raising you and your brothers. You boys would try the patience of a saint, and a saint I ain’t,” she retorted sharply, then tilted her face at him and grinned. “Yes, I know.” She tossed the ball, eyes on the dog as it ran out away from them towards the creek that ran through the back yard. “Jesus Murphy, baby boy. Tell me about your love life,” she unsubtly changed the subject, rolling her eyes at him in a warning to drop the topic. “No time for love, Ma. Sorry to disappoint, but there’s no time for love.” He shifted uncomfortably on the bench and knew his mistake as soon as her eyes zeroed in on him. “Liar,” she accused. “Tell me what’s going on. That’s what a mother is for, to talk to. Well…and cook, take her boys to and from hockey practice, but mostly for talking.” She shook her head, still looking at him. “I met someone.” He ran a hand through his hair nervously. “But it didn’t work out. Turned out she wasn’t as interested in me as I thought.” He shrugged, hoping she’d leave it at that. “But you like her?” She pressed him, bumping his shoulder with hers. “You do. You liiiikkke her.” Drawing out the word, she laughed, bumping him again. “What happened?” His mother picked up the ball and tossed it again. They watched the dog run after it and come back, standing just out of reach with the ball, wagging its tail as it looked them over cautiously. “I had to leave for game five and she was gone before I got back in town. No number, no nothing. As I said, she wasn’t as interested as I thought.” He sighed and reached out, grabbing the ball from where the dog had finally dropped it near her feet. “Maybe she got too scared? Maybe she is interested, but got nervous? Handsome man, big-time hockey player…lots to make a woman nervous about.” She took the ball from his hand and threw it again, then stood, looking down at him with a thoughtful expression on her face. “If you like her, and you want her, I expect you can find her, son. She can’t have gone too far, eh?” She trapped his hand on his knee, threading her fingers through his and squeezing tightly. “So just like then, you gotta figure out what you need to do and do it. No excuses. That dirty word has got no place in our house, and you know better, eh? If you want this woman, then go get her. Take the shot, boy. If not, then move on. Neutral ice has its own rules, right? Go after what you want. Je t’aime, Jase.” She cupped the back of his head in her hand, drawing him close to press her lips on top of his head in a kiss.